There are many ways that students can get involved in volunteering with homeless serving agencies and organizations. This blog post details the activities of two student-led initiatives at York University working with people experiencing homelessness. 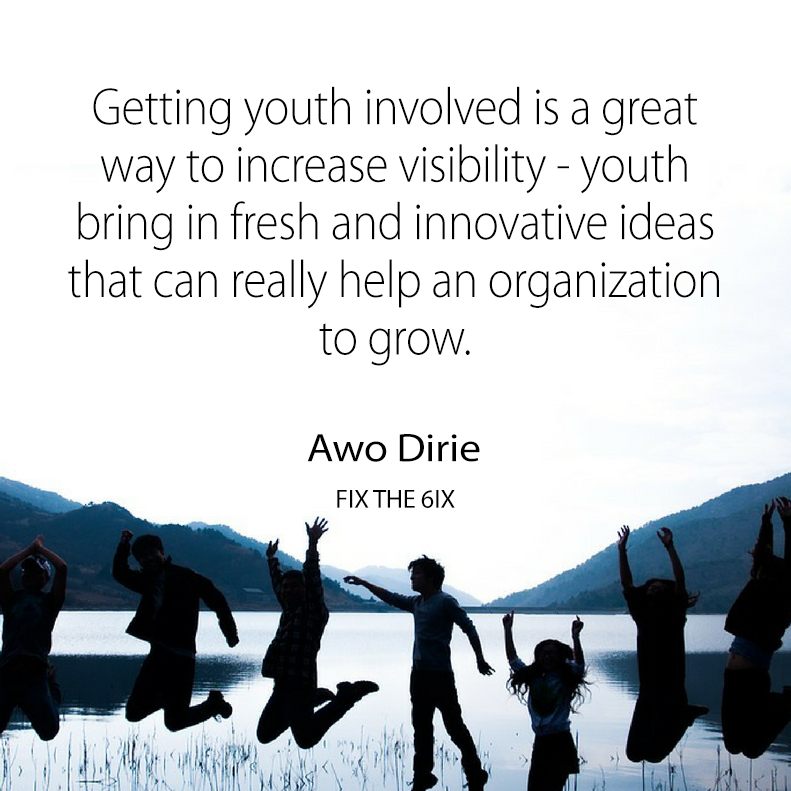 We interviewed Omar Salama and Samantha Memedoska from Keep Toronto Warm and Awo Dirie from Fix the 6ix to find out more about the work that these organizations are doing, and how young people can get involved in volunteering. Omar Salama and Samantha Memedoska are co-directors of Keep Toronto Warm, an initiative that began in November of last year. Keep Toronto Warm works with roughly 15 volunteers at any given time to distribute ‘warmth packages’ to the unsheltered homeless. Student volunteers are at the forefront of all distributions and events, and all donations received go toward purchasing items for their warmth packages. One package includes 2 pairs of warm socks, a hot beverage gift card, a warm blanket and a personalized letter from the donor. In September of this year they launched Keep Toronto Fed, a related initiative that aims to address food insecurity in the city. After collecting perfectly good food deemed by retailers to be ‘unsellable’ (for example, one or two day-old produce that would otherwise go to waste), a team of dedicated students distribute packed lunches around the city. Their first distribution was a huge success, thanks to generous donations from The Great Canadian Bagel company and the work of student volunteers. Awo Dirie is the Assistant Director of Fix the 6ix, an organization that leads two separate programs that serve Torontonians in need; the ReGiftcard Program, and 100 for the Homies. Fix the 6ix repurposes the cash balance on unwanted and partially used gift cards through their ReGiftcard Program. To date, they have collected over 500 gift cards with over $2500 in credit. In addition to providing meals to people both on the street and in shelters, they also purchase clothing and hygiene items for Sistering 24 hour women’s drop in, and donate Cineplex movie tickets to Eva’s Place Homeless Youth Shelter. Although they recognize that their programs offer only “temporary relief to food insecurity” through the continued efforts of student volunteers, they’ve supported over 20 shelters across the GTA. As many Toronto Raptors fans know, after every 100+ point home win, attending fans can take their tickets to redeem a free slice of pizza at participating Pizza Pizza locations. Through the 100 for the Homies program, Fix the 6ix collects tickets donated by fans, and distributes them at Toronto homeless shelters. Since April of the 2015/2016 season 100 for the Homies has collected 13,787 tickets donated by raptors fans. Sometimes shelters simply don’t have the capacity to properly store donated food, especially if it's highly perishable. 100 for the Homies offers a solution to this issue. At shelters, residents can make the autonomous decision whether or not to redeem their ticket for a slice of pizza. After providing us with some background information on their organizations, we asked Samantha, Omar and Awo to answer a few questions to get a better understanding of the work that their organizations do, and their future goals. What inspired you to set up your organization? Keep Toronto Warm: The needs of our community inspired the start of this organization, and continues to inspire us everyday. Specifically, we were triggered by an article that we read which highlighted the death of two homeless individuals during the winter stemming from the lack of resources and space available in shelters. It was not difficult to walk the streets of the downtown core and notice that the community lacked the essentials to survive. Fix the 6ix: It was Deanna Lentini, a student of Kinesiology and Health Science and Founding Director of Fix the 6ix, whose eagerness to make change inspired us. Her overall goal was to make the city a better place by supporting our most in-need residents; Fix the 6ix was prompted by the passion she had for her own town. She wanted to give others an easy and ‘no-cost’ way to help those in-need. How do you think your organization is able to help and impact people experiencing homelessness? Keep Toronto Warm: Our organization is not able to address the structural and larger political issues involved in homelessness, it is however, able to tackle some of the more immediate forces directly affecting the community. As a group we can provide immediate protection from the cold; short-term comfort and access to resources for future support. Fix the 6ix: We work to advocate for and serve the homeless community, and we also help to connect people experiencing homelessness to shelters across Toronto. Ultimately, although we hope to make as many donations as we can to those in need, we also want to start a meaningful discussion about the issue of homelessness in Toronto, and what we can do to change it. How can young people become involved? Keep Toronto Warm: Youth can get involved by lending time to organizations helping to combat larger social issues in the community, like homelessness. Young people often have many resources available to them through their schools and communities, and consequently it’s not too difficult to find support if they would like to start programs like ours. Fix the 6ix: Getting youth involved in anything is a great way to increase visibility and also a great way to bring in people who really want to help. Youth bring in fresh and innovative ideas that can also help an organization to grow and develop. If you are interested in volunteering with either of our programs, you can fill out our online form and email it to volunteer@fixthe6ix.ca. What are the current and future goals that your organization is focused on? 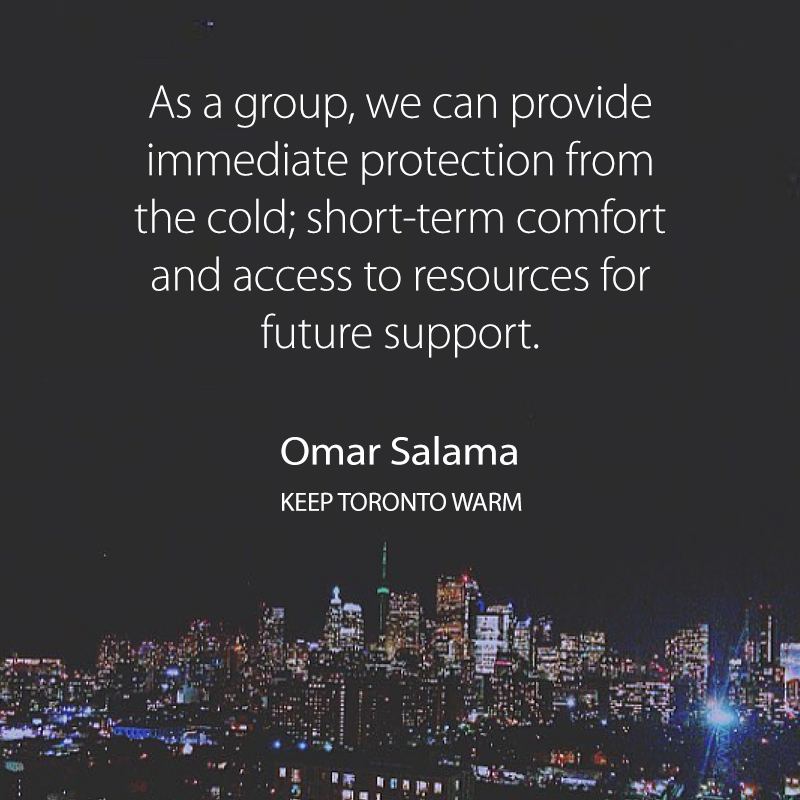 Keep Toronto Warm: Our main goal is to positively impact the lives of people without shelter during the winter by providing them with essential care packages. In the future, we hope to spread awareness in our communities; by educating and highlighting the issue of homelessness, we can hopefully motivate others to get involved in whatever way that they can. Fix the 6ix: Our ultimate goal is to offer visibility and inspire a new understanding of the homeless community in Toronto. In line with our values of promoting equity, inclusion and the importance of social capital, we hope to break the stigma that so often surrounds the issue of homelessness. We would love to focus on working with different shelters in the future, and also connect with universities and colleges outside of York University. Through volunteering with organizations like Fix the 6ix and Keep Toronto Warm, not only are students helping people in need, they’re also fostering empathy and self-efficacy. It is fantastic to see initiatives like these succeeding; they play a crucial role in raising homelessness awareness and challenging stigma and discrimination. In addition to volunteering, other things must be done. In our State of Homelessness in Canada 2016 report, we emphasize that ending homelessness means doing things differently, and not simply managing the problem through relying on emergency services and supports. An alternative is to look at approaches that emphasize prevention and affordable housing solutions. By building on the success of previous interventions that have proven to be successful, like Housing First for example, this can lead to real reductions in homelessness. If we truly want to prevent and end homelessness in Canada, we must also consider the unique needs and circumstances of key populations to create effective, thus tailored, responses to homelessness. This year, the federal government launched a consultation process to inform Canada’s first National Housing Strategy. On November 22nd, What We Heard: Shaping Canada’s National Housing Strategy was released, reflecting the views, ideas and insights of thousands of Canadians who participated in the consultations. Many respondents agreed that a fundamental goal of a National Housing Strategy should be to end homelessness in Canada, and to prioritize the needs of Canadians experiencing homelessness. Although the consultation process is over, you can still write to your local MP, telling them that ending homelessness should be a top priority, and urging the Government to take immediate action on housing with a focused effort on ending homelessness. Education and advocacy are also critical tools that contribute to the national dialogue on ending homelessness. Having conversations with others about homelessness can help to dispell myths and challenge stereotypes. Homelessness, despite its often very visible presence in urban areas, remains a commonly misunderstood social issue. You can learn more about topics, solutions and plans to end homelessness in our About Homelessness section. Where can donations be best used to help people experiencing homelessness? How can I help people experiencing homelessness during winter? We would like to think Omar, Samantha and Awo for taking the time to meet with us and for sharing information about the work that they’re doing. If you’d like to learn more about Fix the 6ix and Keep Toronto Warm, visit their websites, linked throughout this blog post.